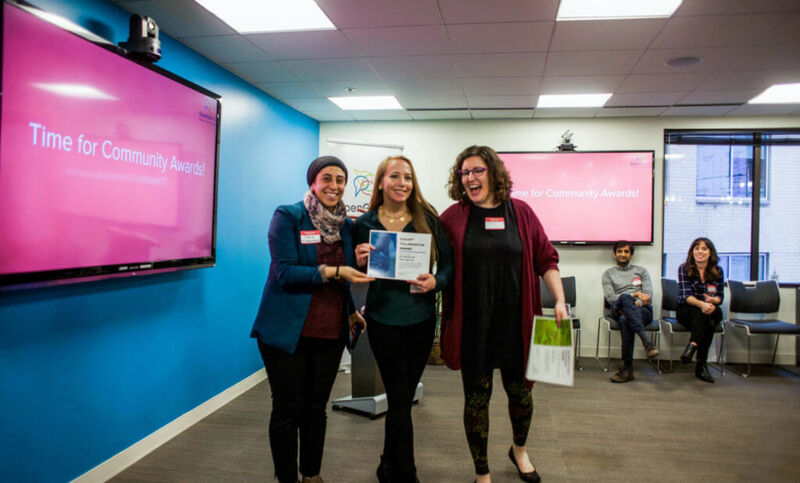 Washington, DC – Open Gov Hub, the world’s first co-working community with a mission focused on ensuring more transparent and open governments around the world, presented Stacy Whittle and Zoe Reiter with the “Coolest Collaboration Award,” April 19, 2018. The award, well-deserved recognition for the extensive, international media attention given to the release of Transparency International’s 2017 Global Corruption Barometer, also celebrates the success that can come about when people with completely different sets of skills and experiences, come together to achieve shared goals. In this case, it was a commitment to fighting corruption. Whittle, a repertory actor not to mention a full-time strategist for Taoti Creative, and Reiter, the US representative to Transparency International, the Berlin-based civil society organization worked side-by-side to ensure the Corruption Barometer was given the attention it deserved. Through TI’s Global Corruption Barometer, tens of thousands of people around the globe have the power to share their first-hand views and experiences with government corruption; it the only worldwide public opinion survey on dishonesty, misconduct, and fraud by those in power. The network of 40 organizations that comprise Open Gov Hub champions justice and government accountability to bring solutions to the many water resources, renewable energy, climate change and urbanization challenges facing the world today.